LEFT: Pinisi trading ship on the Barito River, S.E.Kalimantan, 1983. 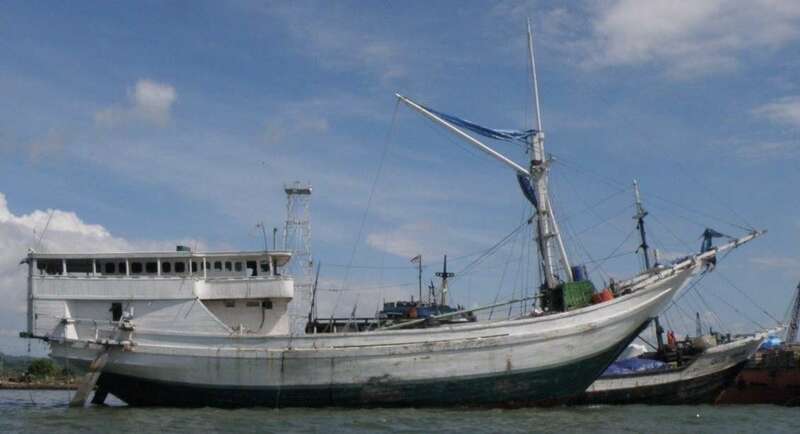 RIGHT: Patorani fishing boat, Makassar Harbour 1985. Photographs: Jeffrey Mellefont. These accomplished seafarers, key participants in the world’s spice trade since ancient times, have also had long-standing economic and cultural connections with nearby northern Australia and its Indigenous coastal populations. 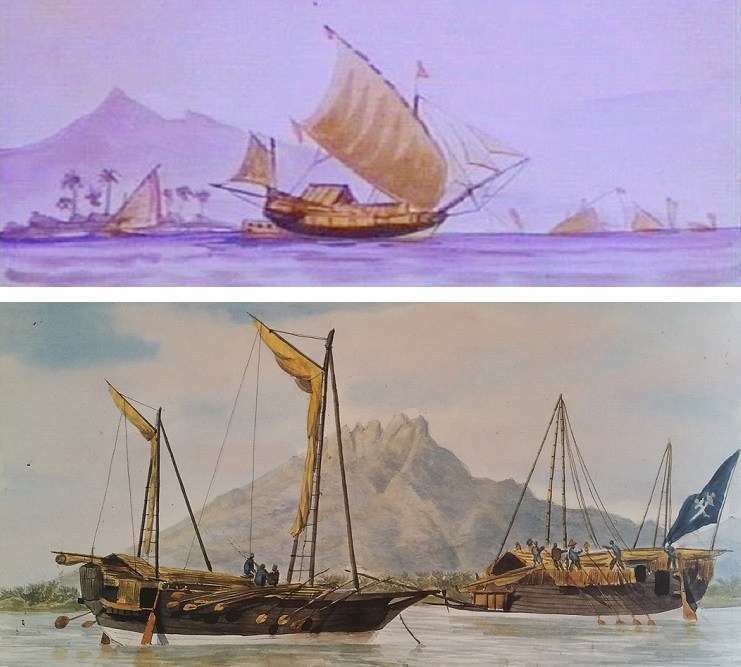 Best-known was a centuries-old fishery that brought annual fleets from the central Indonesian island of Sulawesi, harvesting a costly, luxury marine product for trade with imperial China. This teripang or bêche-de-mer fishery was long-established when British settlers first arrived, but was prohibited in 1906 by customs officials of the new Commonwealth of Australia. In December 2017 the United Nations Educational, Scientific and Cultural Organisation (UNESCO) formally recognised the cultural significance of the boat-building that had enabled such long-distance voyaging (to Australia and many other places as well). Last of the engineless pinisi setting sail for Java with a cargo of sawn timber, Banjarmasin, South-East Kalimantan 1983. Photograph: Jeffrey Mellefont. Motorised traders that developed from the 20th-century sail-powered pinisi haul mixed cargos, servicing remoter island ports. Photograph: Jeffrey Mellefont, Bima harbour, Sumbawa 2011. The same shipwrights also produce smaller or larger timber ‘pinisi’ to order for tourist companies, who install comfortable fitouts and accommodations for diving or cruising holidays. They’re often fitted with auxiliary sails based on the historical 20th-century pinisi topsail-ketch rig. 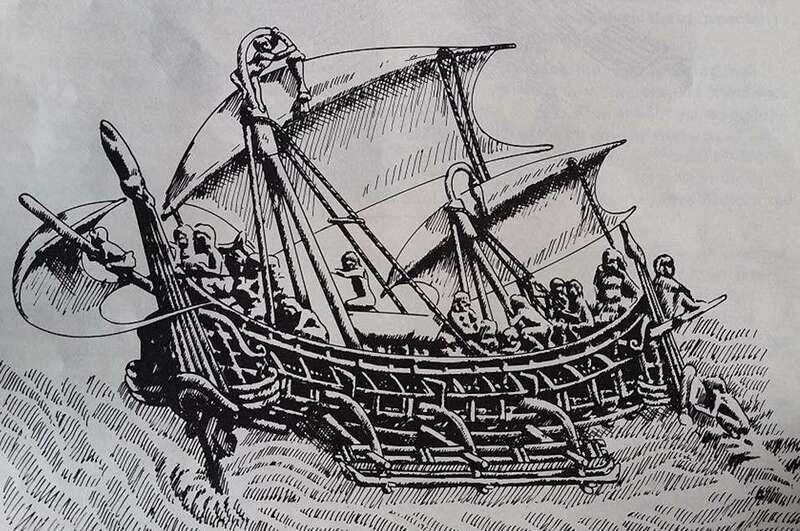 Medieval Javanese ship with tripod masts, canted rectangular sails, quarter-hung rudders, depicted in 8th-century temple frieze, Borobudur, Central Java. Drawing Chris Snoek, from The Prahu by Adrian Horridge, OUP 1981. 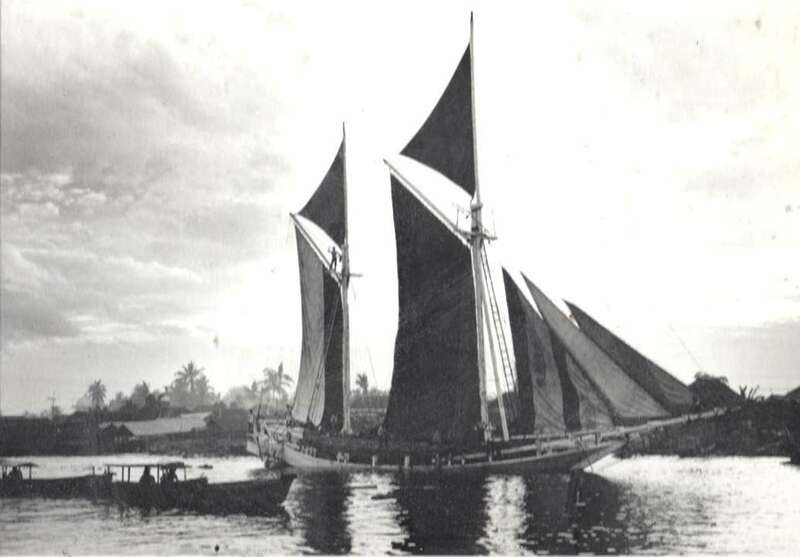 Double-ended Bugis-Makassan pajala-style ship with tripod masts and canted rectangular sails (some of them lowered and stowed on deck), as well as quarter-hung rudders. William Westall, Arnhem Land (Northern Australia), 1803. 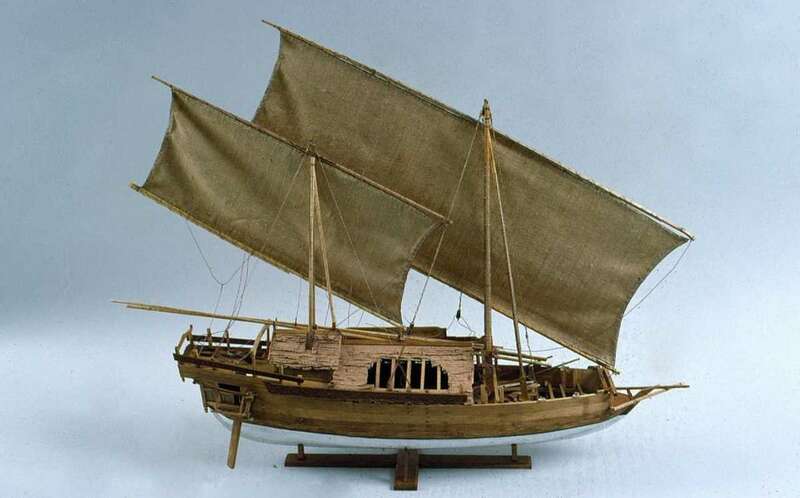 Model of a 19th-century Bugis-Makassan padewakang by Nick Burningham, Northern Territory Museum. Note main and mizzen masts and sails, overhanging stern deck. ANMM Collection 00000463. Later 19th-century illustrations and ship models show developments of this design. Large voyaging ships from this culture, called padewakang, were now built with multiple masts and overhanging, squared-off stern structures, influenced possibly by those ships visiting from Europe, China or the Indian Ocean. 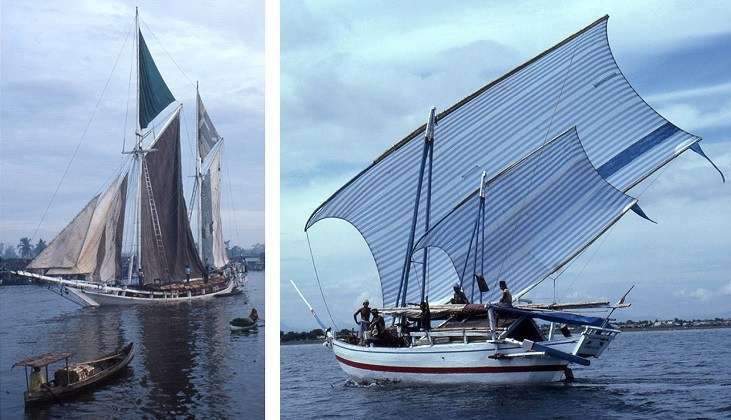 A replica padewakang was built in Sulawesi and sailed to Darwin in 1988. It is preserved in the Northern Territory Museum to illustrate the historical Bugis-Makassan voyages. TOP: Javanese ‘jonque’ with added Western bowsprit, jibs and spanker, watercolour by Thomas Baines 1856. Collection National Library of Australia. 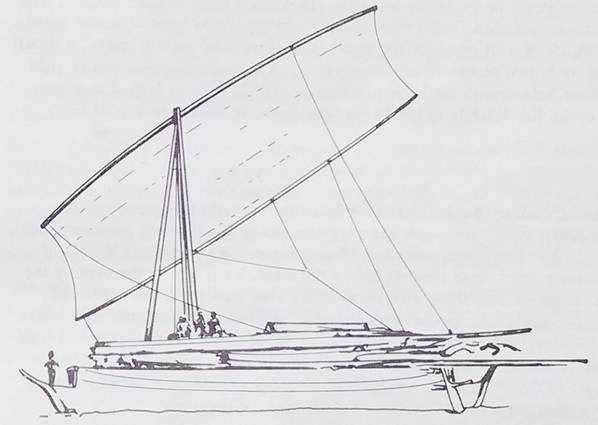 LOWER: Early record of standing-gaff ‘ketch’ rig on a Sulawesi ship, 1831. Cargo vessels of Makassar, at Besuki [Java], watercolour by François-Edmond Pâris. Collection Musée de la Marine, Paris. 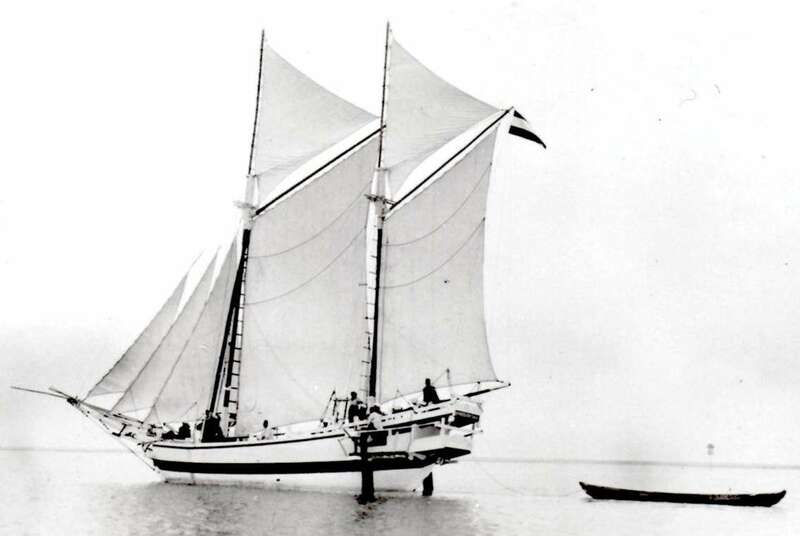 With three jibs flying from a novel, triangular bowsprit, and separate topsails for lighter winds, the ketch-rigged palari-pinisi offered easier handling of its smaller individual sails and more flexible sail combinations for different wind strengths. This became a vital advantage as engineless pinisi grew from 20 to 300 tonnes to meet a pressing need for shipping in the early decades of independence after WWII. The versatile rig came to dominate long-distance trade routes across the archipelago, until motorisation of this fleet was completed in the 1980s. Palari-pinisi trader at Makassar, South Sulawesi 1932. Photograph: Geoffrey Ingleton/RAN. ANMM Collection. Continuity of boat-building traditions. LEFT: Study for replica of a 19th-century padewakang, Nick Burningham 1987 Northern Territory Museum. RIGHT: Patorani, a Makassan offshore fishing vessel 1985. Photograph: Jeffrey Mellefont. Very few traditions are completely hermetic and these builders have embraced electric drills, chainsaws and sawn planks to speed up production. Massive trading vessels of 500 tonnes are still hand-built on beaches by the heirs of these ancient traditions. 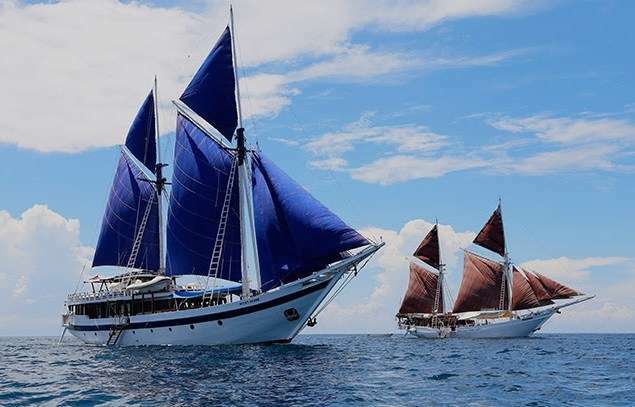 Tourist cruise ships operated by Indonesian company SeaTrek, helping to preserve pinisi heritage and sail-handling skills. See the author’s other blogs set on Ombak Putih (left) and Katharina (right). Photograph: SeaTrek. — Jeffrey Mellefont, Honorary Research Associate.